This beautifully sculpted, collectible figure from our Prehistoric Life Collection measures 5.9''L x 2.8''H. Each prehistoric figure in our collection has been approved by archeologist Anthony Beeson, a well-respected expert in paleoimagery. 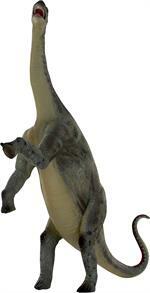 CollectA's detailed replica of the long-necked Brachiosaurus Baby is lifelike down to the wrinkles in its skin. 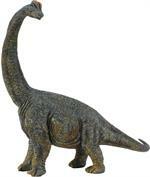 The Brachiosaurus Baby is depicted craning its long neck to look to the rear. Measures 3.1'' x 2.5''H. 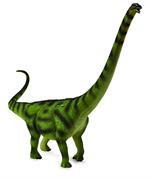 The Brachiosaurus ate between 440 and 880 pounds of plants every day. It had a relatively small tail compared to other Sauropods, with longer front legs than back which gave it a height advantage when foraging for food. 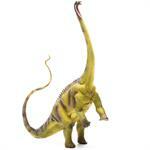 Measures 7.3" L x 5.2" H.
Diplodocus means: "Double beam", and this comes from a the feature of the backbone. They were also the longest dinosaur at 88 feet long. Measures 7.87 in L x 2.76 in W and is suitable for children ages 3 and up. 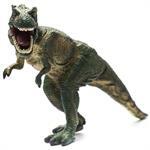 Tyrannosaurus Rex was one of the greatest predators that ever lived. The name means "Tyrant Lizard". They could sprint up to 20 mph and they grew to be 40 feet in length. 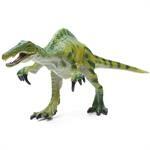 This realistic dinosaur figurine measures 7.3"L x 3.5"H.
Kentrosaurus means "Spiked Lizard". It weighed as much as a car and could swing its tail at 81MPH. Covered in armor with plates made up of spikes . Measures 5.12 in L x 1.57 in W and is suitable for childrens ages 3 and up. 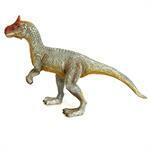 Mapusaurus dinosaur is a carnivore from the Upper Cretaceous period. It's name means "Earth Lizard". This realistic figurine measures 32cm x 12.5cm. Mapusaurus (Earth Lizard) was a giant carnosaurian dinosaur from Argentina. 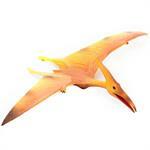 Pteranodon's head was very long and pointed and it had four toes on each foot and three fingers on each hand. It's name means "toothless wing." This flying reptile could fly high and for long periods of time. ollectA's replica of a Stegosaurus Baby is lifelike down to the texture of its hide and the knobs growing down its back and tail. Those knobs would have continued growing to become a double row of bony plates. Measures 4.1''L x 1.6''H. CollectA's replica of the armored Stegosaurus is lifelike down to each bony plate on its spine and tail. The plant-eating dinosaur lived in the Late Jurassic Period in western North America. Measures 6.7''L x 3.5''H. 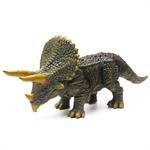 CollectA's replica of a Triceratops Baby is lifelike down to its budding horns and distinctive bony frill. 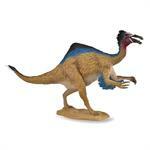 The baby dinosaur is the perfect addition to your dinosaur collection. Triceratops grew to be massive. Measures 3.3''L x 1.4''H. 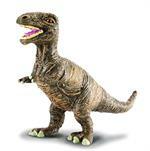 CollectA's detailed replica of a Tyrannosaurus Rex Baby may be small, but it still looks fierce. This figure is lifelike down its fearsome teeth and the wrinkles in its bumpy hide. 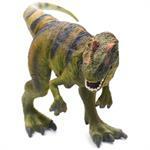 The T-Rex is depicted in a threatening stance. Measures 3.1'' x 2.4''H. This beautifully sculpted, collectible figure from our Prehistoric Life Collection measures 4.3''L x 3.5''H. 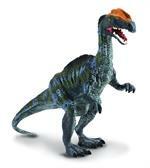 The first specimens of the Dilophosaurus were found in Arizona in 1942. In 1964, another specimen was found in the same area. 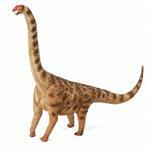 Paleontologists theorize that it may have been able to rear up on its hind legs, which is how we have depicted the long-necked sauropod. This high quality 1:40 scale figure measures 9''L x 11.8''H. Instantly recognizable from its head adornment, the adult Parasaurolophus probably grew to be approximately 31 feet long, and its skull alone measured over 5 feet long. This beautifully sculpted, collectible figure from measures 3.9'' x 1.6'H. This beautifully sculpted, collectible figure from our Prehistoric Life Collection measures 6.7''L x 2''H. Each prehistoric figure in our collection has been approved by archeologist Anthony Beeson, a well-respected expert in paleoimagery. Based on the fossil remains, paleontologists estimate this dinosaur may have grown to be over 110 feet in length. This beautifully sculBased on the fossil remains, paleontologists estimate this dinosaur may have grown to be over 110 feet in length. The creature is depicted in the act twisting its giraffe-like neck to look behind it. With front legs that were longer than its back legs, the Brachiosaurus stood about 50 feet tall, perfect for foraging among the tree tops. Measures: 10.6 x 3 x 11.2"
Cryolophosaurus is the first meat-eating dinosaur to be discovered on the frozen continent of Antarctica. Cryolophosaurus was a large theropod dinosaur, with a bizarre crest on its head. Due to the resemblance of this feature to Elvis Presley's haircut. The Chinese titanosaur Daxiatitan, like most giant sauropods, is known only from partial skeletal remains: a number of vertebrae, including several from the neck, a shoulder blade, and a femur. The Daxiatitan measures figure 10.3" L x 8.2" H.